Animals all face the same challenges: finding enough to eat and surviving long enough to pass on their genes. While there are endless ways Nature has addressed these challenges, it sometimes arrives at the same solution in species that are only distantly-related. This phenomenon, called convergent evolution, can be seen in the similar body shape of fish and dolphins, the sharp spines of hedgehogs and porcupines, and the opposable thumbs shared by possums and primates. The hummingbird hawk-moth (Macroglossum Stellatarum) samples nectar from a flower. Credit: Diliff. Occasionally, species converge so closely that they bear an uncanny resemblance to each other. 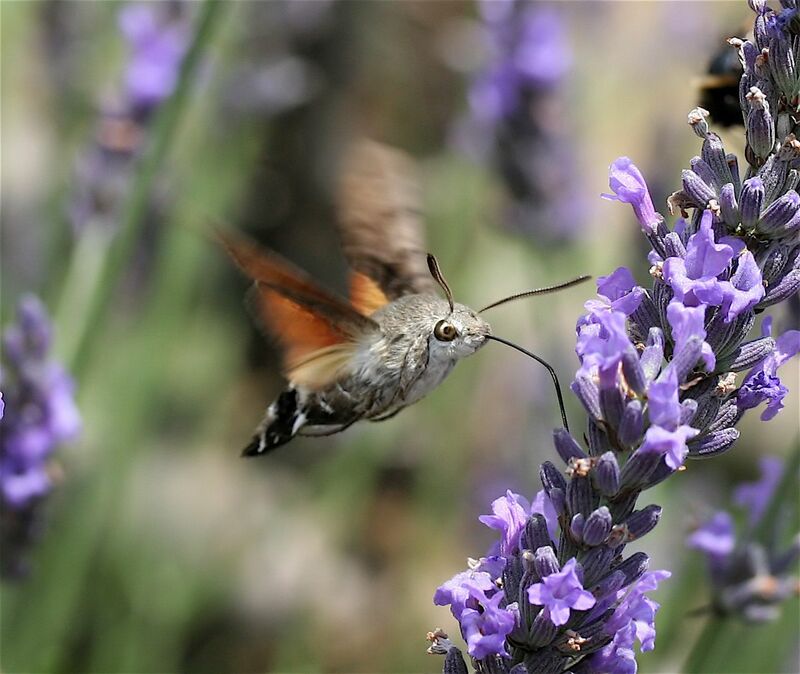 An excellent example is the hummingbird hawk-moth (Macroglossum stellatarum); an insect that looks and behaves so much like a hummingbird that they are difficult to tell apart from a distance. Not only does the moth flit about like a hummingbird, it even appears to have ‘feathers’ and a ‘tail’, which are actually elongated hairs. 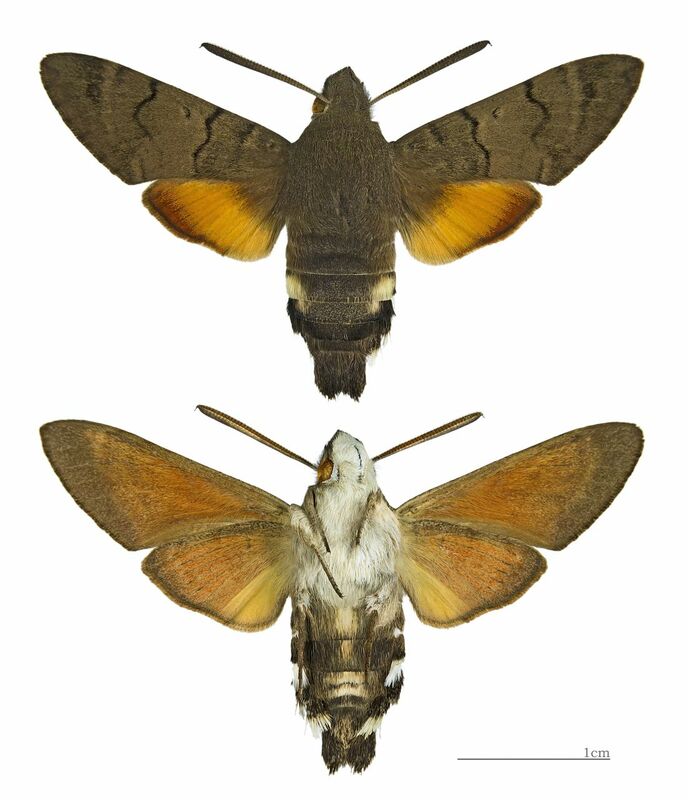 Dorsal and ventral view of the hummingbird-hawkmoth. Credit: Didier Descouens. Like its namesake, the hummingbird hawk-moth hovers in front of flowers, collecting sweet nectar from within. In place of a beak it has a long straw-like proboscis that it uses to siphon off the sticky fluid. At roughly an inch long this proboscis is nearly the length the moth’s body, so it keeps the appendage coiled up tightly when not in use. Stellatarum eats a vast array of flowers, but some of its favorites belong to the groups Jasminum, Buddleja, Nicotiana, Tulipa, Primula, Viola, Syringa, Verbena, Echium, Phlox and Stachys. Tracings made from a high-speed film recording of Manduca Sexta, another moth in the Sphinx moth family, shows the figure-eight pattern traced by the wing. Courtesy of Sandy Willmott. 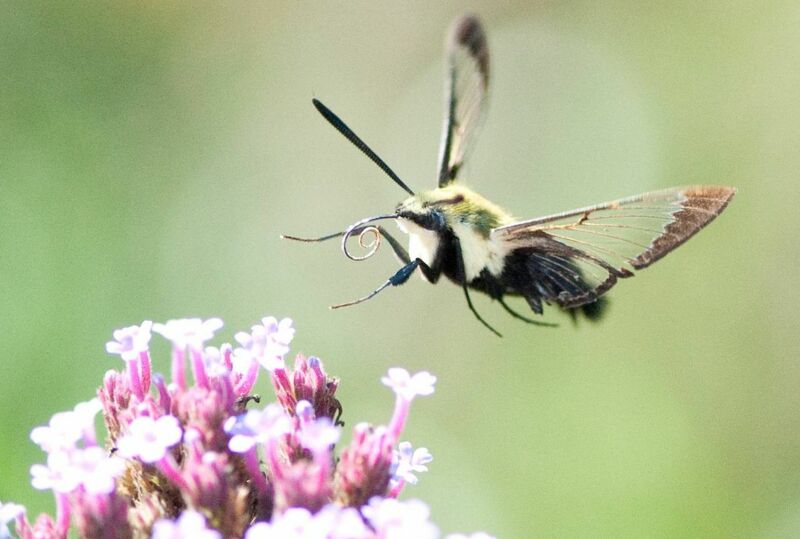 Similar to other hovering insects, birds and bats, the hummingbird hawk-moth generates lift by moving its wings in a shallow figure-eight pattern. This motion creates a spinning vortex of air on the upper surface of the wing, which generates a well of low pressure. The higher pressure zone below the wing essentially pushes the moth upward, keeping it airborne. 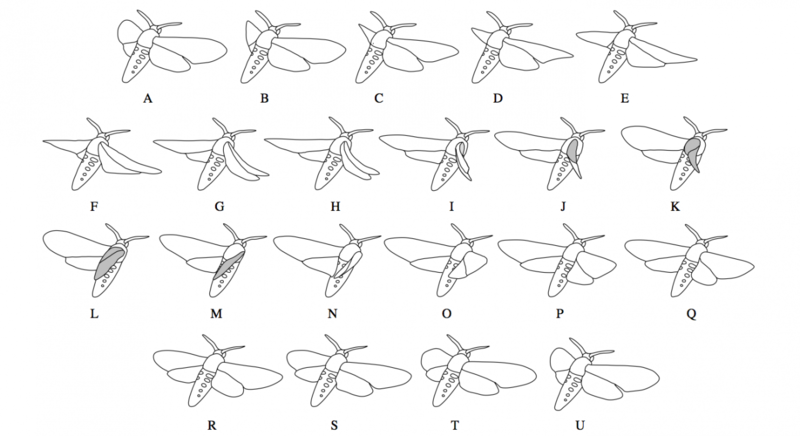 Insect wings are relatively rigid, so they are less efficient at this mode of flight than either bird or bat wings. While hummingbirds can hover by generating around 50 wingbeats per second and bats about 17 beats per second, the hummingbird hawkmoth tops them both at 85 beats per second! In addition to being an agile hoverer, the moth is also a fast flier. 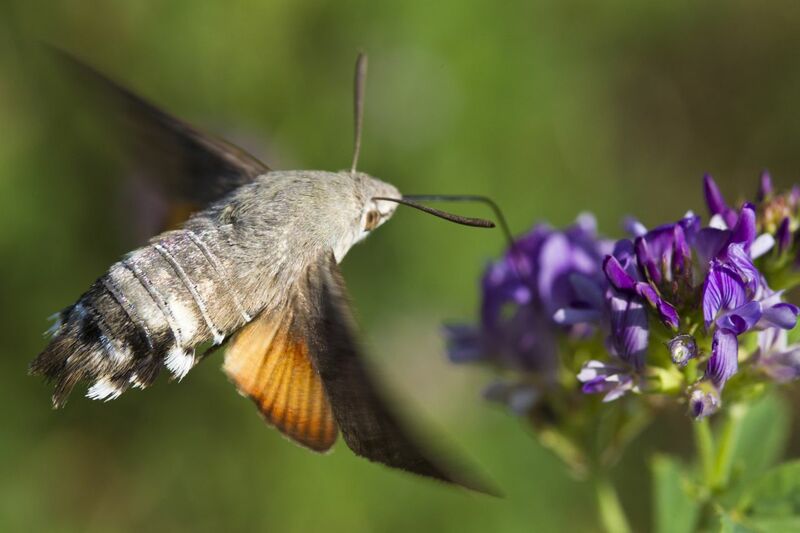 Scientists have yet to measure the hummingbird hawk-moth’s top speed, but another related species of hawkmoth, Manduca sexta, was clocked at 12 miles per hour (5.3 meters per second). We can infer that Stellatarum’s airspeed record is probably in the same ballpark. When in the presence of a hummingbird hawk-moth, you may get the impression that its eyes are following you. However, this is only an illusion. Like other insects, the eyes of the hummingbird hawk-moth are made up of many tiny facets arranged in a roughly hemi-spherical pattern. Each facet contains a crystalline lens and a number of photoreceptor cells. 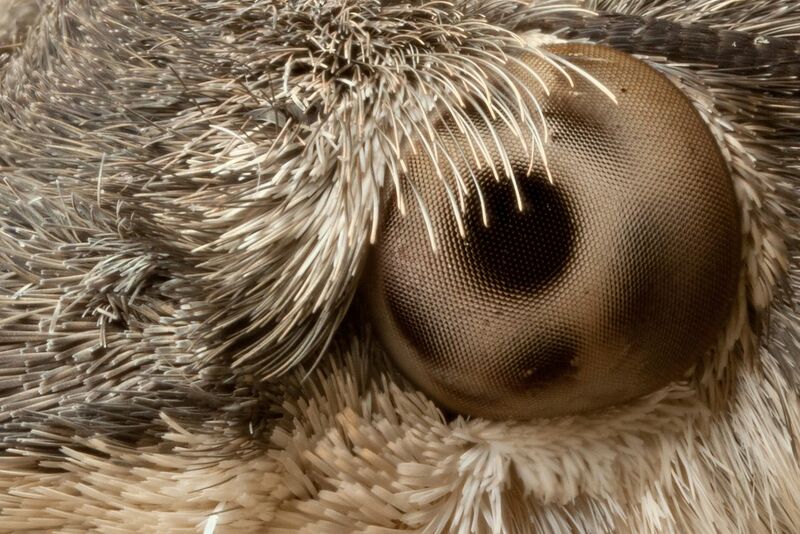 This allows the moth to see in many directions at once, although in much less detail than the human eye. The dark spot, or ‘pseudo-pupil’, that seem to follow your movement is actually a patch of facets absorbing most of the light coming from your direction. As you move relative to the moth’s eye, the patch seems to move, when in fact you are seeing a new patch of light-absorbing facets. The hummingbird-hawkmoth is one of many moths in the Sphinx moth family (Sphingidae), so-called because of their resemblance to the famous Egyptian Sphinx. Many of the moths in this group are nocturnal or crepuscular (feeding at twilight) and have eyes that are good at seeing in low light, but poor at picking out detail. 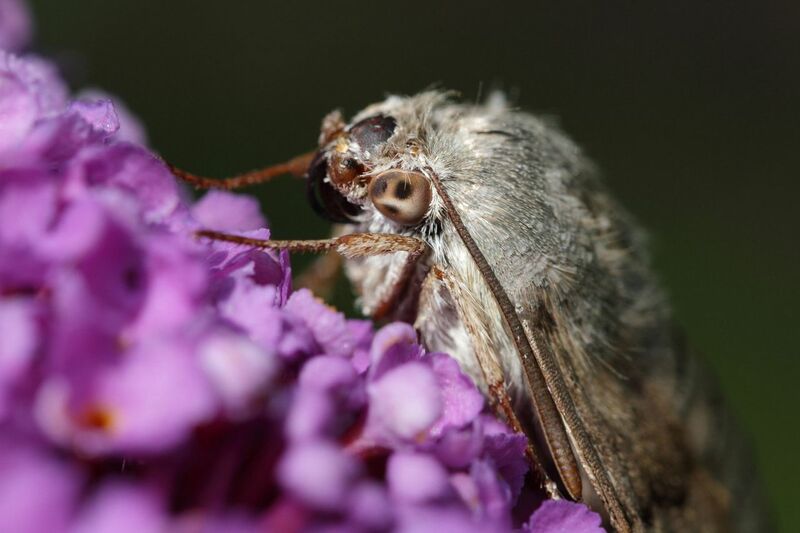 In contrast, the hummingbird hawk-moth prefers to feed in the bright daylight, so it’s eyes have developed some unusual features not seen in other moths. For example, the center of its eye is packed with more photoreceptors cells than the edges, allowing it to see more detail in the objects directly in front of it. This probably evolved to help the moth judge its distance from flowers, which are prone to bob and sway in the wind when the moth is feeding. Stellatarum is found year-round in the temperate regions of Southern Europe and Asia but its range extends into Northern Africa in the winter. During the summer, it pushes northward into Europe and Russia, often migrating great distances. Europe doesn’t have any wild hummingbird species, so the sudden seasonal appearance of hummingbird hawk-moths often leads to many false reports of hummingbird sightings. Although Stellatarum is absent from North America, it has a number of ‘hummingbird moth’ look-alikes belonging to a different genus. Just like the hummingbird-hawkmoth they resemble hummingbirds both in appearance and behavior–and are yet another example of convergent evolution. Pfaff, M. & Kelber A. Observations on development and hibernation of the hummingbird hawkmoth Macroglossum stellatarum. Entomologische Zeitschrift, 2005. Next Post Did You Watch Nature’s Miracle Orphans? Tell Us What You Think!